Comprehensive Coverage – The chapters are divided into three parts: Foundations; Assessment and Measurement; Prevention and Intervention Programs. Together they provide a comprehensive review of what is known about the types, causes, and effects of school violence and the most effective intervention programs that have been developed to prevent violence and promote safe and thriving school climates. Evidence-based Practice – Avoiding a one-size-fits-all approach to prevention and intervention, the focus throughout is on the application of evidence-based practice to address factors most commonly associated with school violence and safety. Implications for Practice – Each chapter bridges the research-to-practice gap, with a section delineating implications for practice of the foregoing research. Chapter Structure – To ensure continuity and coherence across the book, each chapter begins with a brief abstract and ends with a table showing the implications for practice. International Focus – Acknowledging the fact that school violence and safety is a global concern, this edition has increased its focus on insights learned from cross-national research and practice outside the USA. 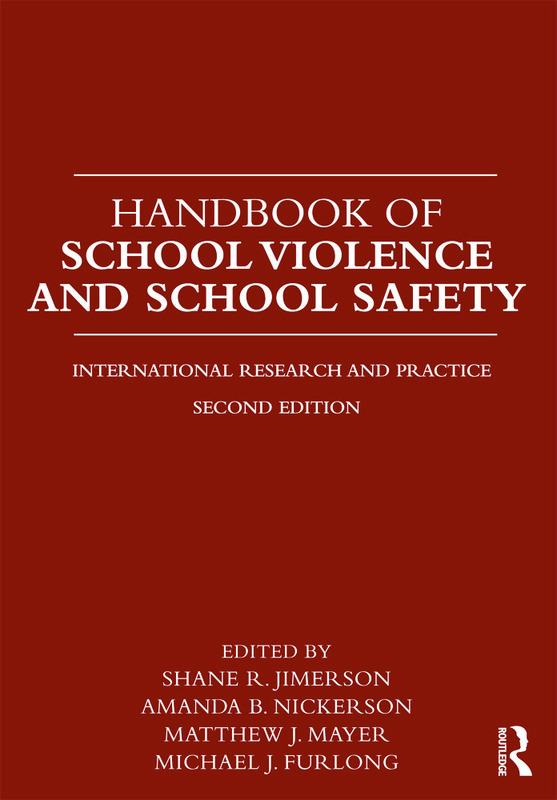 Expertise – The editors and authors are experienced researchers, teachers, practitioners, and leaders in the school violence field, their expertise includes their breadth and depth of knowledge and experience, bridging research, policy, and practice and representing a variety of international organizations studying school violence around the world. Shane R. Jimerson, Ph.D. is a Professor at the University of California, Santa Barbara. Dr. Jimerson is the co-founder of the International Institute of School Psychology (http://education.ucsb.edu/jimerson/IISP). Among numerous publications, he is the lead-editor of The Handbook of Bullying in Schools: An International Perspective (2010, Routledge) and The Handbook of School Violence and School Safety: From Research to Practice (2006, Lawrence Earlbaum, Inc), a co-editor of Best Practices in School Crisis Prevention and Intervention (2002, National Association of School Psychologists), and the lead editor of The Handbook of International School Psychology (2007, SAGE Publishing), and The Handbook of Response to Intervention: The Science and Practice of Assessment and Intervention (2007, Springer Science). He is also co-author of School Crisis Prevention and Intervention: The PREPaRE Model (2009, National Association of School Psychologists), The Mourning Child Grief Support Group Curriculum (2001, Taylor and Francis), Identifying, Assessing, and Treating Autism at School (2006, Springer Science), Identifying, Assessing, and Treating Conduct Disorder at School (2008, Springer Science), Identifying, Assessing, and Treating PTSD at School (2008, Springer Science), Identifying, Assessing, and Treating ADHD at School (2009, Springer Science), and Promoting Positive Peer Relationships (P3R): Bullying Prevention Program (2008, Stories of Us). Amanda B. Nickerson, PhD, is an Associate Professor and Director of the Jean M. Alberti Center for the Prevention of Bullying Abuse and School Violence in the Department of Educational and Counseling Psychology at the University at Buffalo, the State University of New York (SUNY). She was previously at the University at Albany, SUNY, where her research focused on school crisis prevention and intervention, with an emphasis on violence and bullying prevention. She has also written on the critical role of schools, parents, and peers in promoting social-emotional strengths and competencies of children and adolescents. Dr. Nickerson is the lead author of Assessing, Identifying, and Treating Posttraumatic Stress Disorder at School (2009, Springer) and co-author of School Crisis Prevention and Intervention: The PREPaRE Model (2009, National Association of School Psychologists). She reviews for several major journals and is on the editorial board of School Psychology Quarter, Psychology in the Schools, and the Journal of School Violence. Matthew J. Mayer, PhD, is an Associate Professor in the Department of Educational Psychology in the Graduate School of Education at Rutgers, the State University of New Jersey. Dr. Mayer’s research includes analyzing national level data and modeling processes associated with school violence and disruption and related prevention programming. He also has written on cognitive-behavioral interventions and methodological issues in structural equation modeling and evidence-based standards in education and the allied professions. He reviews for several major journals and is an editorial board member of the journals Behavioral Disorders and Journal of School Violence. Dr. Mayer currently serves as President of the Consortium to Prevent School Violence, a national group dedicated to disseminating evidence-based violence prevention best practices to schools and allied youth agencies. Michael J. Furlong, PhD, is a Professor in the Counseling, Clinical, and School Psychology Department, Gevirtz Graduate School of Education, University of California Santa Barbara. He is a member of the Society for the Study of School Psychology and a fellow of the American Psychological Association (Division 16) and the American Education Research Association. He is the Editor of the Journal of School Violence and the Director of the Center for School-Based Youth Development.